More than 7000 km away in Romania — Ayurveda — the ancient Indian medicine system is alive. The unending passion of allopathic doctors and common people of the country of blue Danube makes them well versed with the Ayurveda. Guru and the shishyas: Romanian doctors listen attentively as Dr Sanjeev Sood imparts his knowledge about the concepts of the Ayurveda, the ancient Indian system of medicine. 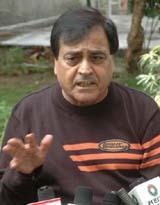 Veteran playback and bhajan singer Narendra Chanchal said he was “completely innocent” in a Copyright Act violation case, filed at Amritsar against him by Brij Bharadwaj, a son of late Chaman Lal Bharadwaj, a lyricist. Traffic chaos in Phagwara gives nightmares to drivers even during the day. In the absence of proper traffic management at vital points, chaos prevails and the age-old practice of ‘might is right’ guides most of drivers. The talent and achievement of Amanpreet Singh was recognised by the Lyallpur Khalsa College, Jalandhar, as the management honoured him with a cash award of Rs 51,000 on Monday. Dr Rajnish Arora, director, placements, Guru Nanak Dev University, delivered a lecture on job opportunities for professional students at Guru Nanak Dev University College, Basti Nau, on Monday. An inter-Army Schools contest for model making competition on themes related to science and geography was organised at Army Public School, Jalandhar Cantonment, on Saturday. A Central Committee was organised at the Kamla Nehru College for Women in Phagwara. Jyoti Walia, a student of Class B Com (third year) was selected the head girl while Gurjit Kaur was chosen as her deputy. Besides, 10 students were nominated as members of the committee. The District Sainik Welfare Office will start a one-year computer course approved by National Council of Vocational Training, Ministry of Labour and Employment, Government of India, will commence on August 30. Lieut-Col Manmohan Singh, Deputy Director, Sainik Welfare, said ex-servicemen, their widows, wards of ex-servicemen and serving defence personnel from the three services with a minimum qualification of Plus Two with at least 50 per cent marks or three-year engineering diploma holders were eligible to take the course. A four-day trade fair was organised at Desh Bahgat Yadgar Hall that concluded on Monday. Various consumer products, including home appliances, computer hardware, furniture, automobile, finance, electronic and electrical goods, juices, handloom, crockery, digital photography equipment were put on display. A rakhi-making competition was organised at Seth Hukum Chand SD Public Senior Secondary School, Kapurthala Road. The students made rakhis using toys, threads, glitters and accessories. Ms Manju Arora, principal, appreciated the efforts of the students and gave away prizes to the winners of contest in different classes. Former junior world wrestling champion Randhir Singh Dhira won the gold medal in the 97kg category in the age group of 35-40 years at the 15th World Veteran Wrestling Championship at Riga, Latvia, held from August 4 to 6. In our country of its birth, the ‘guru-shishya parampara’ may be under threat but it has inspired the Romanian doctors to adhere to the age-old Indian tradition of the teacher-taught tradition. Almost similar is the scene in other western countries like Holland and Belgium. Wisdom of Ayurveda had travelled from Guru Agnivesh to his disciple Acharya Charak through the ‘guru-shishya parampara’. After being bowled over by Ayurvedic way, Romanian doctors were keen to learn the intricacies of the Indian system. They formed the Medical Association of Romania and invited Dr Sanjeev Sood, a renowned Ayurvedic expert and Reader in the Ayurvedic Medicine Department of the Jalandhar-based Dayanand Ayurvedic College, to imbibe knowledge from him. 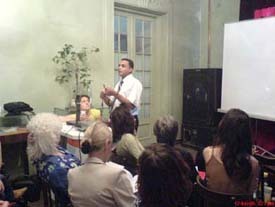 Dr Sood was pleased with the high degree of passion and curiosity of people about Ayurveda. “My pride in the fact that I was going to teach 40 regular allopathic doctors of Romania was dented when I found that more than half of them already had knowledge about the Ayurveda. People there were already using more than 250 common Indian herbs for treatment of common diseases. Some of doctors had already put in 15 years of research in the field of Ayurveda. So, it became more challenging and exciting than my previous stint of teaching Ayurveda in Holland and Belgium,” said Dr Sood, whose two-and-half-month long teaching assignment in Romania ended recently. A large number of people of Romania, particularly in Bucharest, Cluj-Napoca, Iasi, Timisoara, and Craiova, regularly used over 250 species of Indian herbs on the basis of basic Ayurvedic principles of ‘rasa’, ‘guna’, ‘virya’, ‘vipaka’, and ‘dosh prabhava’ - taste, property, potency, post digestive effects. “In fact, Romanian doctors and even common people, provided me with a new challenge to teach and to satisfy their highly professional queries for their being already well versed with most of parts of Ayurveda. There are many things that I gained and one of them is a high degree of curiosity to learn about new things and concepts. “It was an experience for me when I successfully explained to them the intricacies of Ayurveda in co-relation to modern medicine and practices. “After completion of my teaching assignment, I felt a ‘mini India’ lived in Romania as well and that the long distance had ceased to make a difference. Most doctors and people have already started following the diet and life-style matching to the ones prescribed by the Ayurveda,” said Dr Sood, adding that people of Belgium and Holland were also extremely interested in Ayurveda. Ayurveda literally means ‘science of life and longevity.’ It is a qualitative, holistic science of health and longevity, a philosophy and system of healing the whole person, body and mind. Ayurveda is made up of two Sanskrit words: ‘Ayu’, which means life and ‘Veda’, which means the knowledge of. According to the ancient scholar Charaka, ‘ayu’ comprised four essential parts - combination of mind, body, senses and the soul. It developed over 5000 years ago. A gift of the Gods, it was codified by the sage-physician Charaka and the sage-surgeon Shushruta. This ancient science is health, not disease, specific and takes into account the patient’s entire personality - body, mind and spirit. In the Rig Veda, over 60 preparations are mentioned that could be used to assist an individual in overcoming various ailments. The origins of this system, of course, are lost in time. In legend it is said to had been taught by the creator, Brahma, to the Prajapati Daksha (one of the lords of the animals), who taught it to the divine twins called the Ashwinikumars. Ashwinikumars are the heavenly healers. They taught Indra, the chief of the shining ones. They were deities of early Vedic times. When mankind started suffering from diseases, wise men like Bharadvaja learnt from Indra the knowledge of medicine. Gradually the huge amount of knowledge accumulated was divided systematically into different branches. All matter is thought to he composed of five basic elements (panchamahabhutas ) which exhibit the properties of earth (prithvi), water (jala), fire (tejas), wind (vayu) and space (akasha). These elements do not exist in isolated forms, but always in a combination, in which one or more elements dominate. “I have never claimed anywhere that the song belonged to me or that I penned it. Certain people have indicted me wrongly as I had sung on the basis of whatever matter was provided to me by the music company concerned. I am going to file a defamation suit. My intentions are very clear and I am innocent,” said a visibly hurt Chanchal. Bharadwaj has alleged that Chanchal had rendered the song, penned down by his father, without prior permission of his father or the family. “The court will issue its verdict but I want to put forth my point of view,” said Chanchal. Mismanagement of traffic is glaringly visible in all parts of the city, particularly on the G.T. Road near the bus stand, Banga Road, Sarai Road and Gaushala Road and the outskirts. The most irritating and unruly traffic scenes greet residents at the entry points to the city at Hoshiarpur Road, Banga Road and Hargobind Nagar. Traffic policemen are conspicuous by their standing around and not lifting a finger to help the traffic along. The authorities concerned have duly ensured their ‘presence’. Non-functional or dysfunctional traffic lights not only add to the woes of commuters and vehicle users at some of these points, but also add to the general confusion. Bottlenecks at various chowks and roads, courtesy private buses operators at unauthorised bus stops, especially at the National Highway No 1 slow down the traffic, besides being a hazard. The local traffic police have failed to act against them and there is no move to channelise traffic. Drivers of private buses stop at places like Sugar Mill Chowk, Hargobind Nagar traffic light point, Gol Chowk and Urban Estate crossing and send all traffic in a tizzy. Some drivers stop buses bang in the middle road right under the noses of the traffic police. Despite complaints by the daily commuters and the residents, nothing has been done. Authorities have failed to enforce rules to smoothen the flow of traffic. Talking about inconvenience being faced by the commuters due to these undesignated bus stops, Mr Parveen Verma, a shopkeeper, says: “Commuters have to stay on their side in spite of the green lights due to long queue of buses in the chowk. Nineteen-year-old Amanpreet Singh, along with Zakir Khan and Bapu Banjare, won the bronze medal in the 10m air pistol event in the junior section at the 49th ISSF World Shooting Championship held in Zagreb, Croatia, recently. 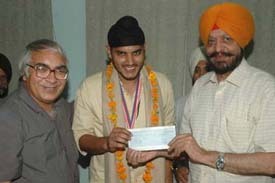 The cheque was presented to the young shooter by Mr Balbir Singh, a former MP and the president of the governing council of the college. A BA-II student Amanpreet did his Plus Two with science subjects but switched over to arts as shooting took up more of his time. Shooting is an expensive sport and the college has taken a step forward in providing cash incentive to the young shooter. 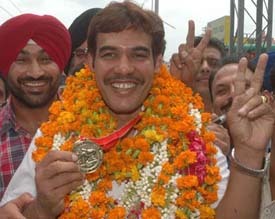 He competed against world-class shooters and missed the team silver medal by a whisker. Amanpreet left for Delhi on Monday to join a trainingcamp before the SAF Games to be held in Colombo, Sri Lanka, where he is expected to reap a rich haul of medals. He inspired the students to fix a minimum target of achieving 60 per cent marks to assure a good placement. He urged the students to improve their communication skills, will to work hard and organising capacity. He asked them to create e-groups and make joint efforts with the use of high communication technologies. Dr Usha Kapoor, principal, motivated the students for good academic performance, high morale and positive attitude. Four Army Schools and two Army Public Schools under 11 Corps participated in the exhibition, each represented by eight to 10 students. Each group had four sections showcasing models on physics, chemistry, biology and geography. The themes varied from vermin-compost, female foeticide, soil management and tsunami control. The overall trophy of the contest was bagged by the host team in the senior group and Army School, Amritsar, in the junior group. Brig A.K. Pandey, chairman of the host school, and Mr Harish Rawal, principal, were present on the occasion. College principal Kusum Verma also honoured students who had brought laurels to the college in the university examinations. Tree plantation: Environment Society of Phagwara organised a tree plantation camp at the Desh Bhagat Yadgari School at Kultham village. Mr Malkiat Singh Ragbotra, president, Phagwara Nagar Council, encouraged the students of the school to grow more trees to keep the environment pollution-free. Madan Mohan Khattar, secretary, Sawachchta Abhiyan Manch, stressed the need for nurturing of the trees after its plantation and asked the students to keep their surroundings clean. He said the youth, especially school students, can play an important role in creating awareness about the importance of a clean and green environment. On this occasion, uniforms to 45 needy students were also distributed. De-addiction camp: Government Elementary School held a de-addiction camp under the Child Development Project at Manawali village on Saturday. Ms Vidyawati, DPO, was the chief guest. Speaking on the occasion, she sought the cooperation of the student against the drug menace. Ranvir Singh, president, Helpline, a social organisation, apprised the students about steps being taken in this regard in Phagwara. Competition: A question-answer competition was organised at the GDR Convent School in Rawalpindi village on Saturday. Students from Class V to X took part in the competition. Jasmine Group got the top spot in the one-hour session. The District Sainik Welfare Office will start a one-year computer course approved by National Council of Vocational Training, Ministry of Labour and Employment, Government of India, will commence on August 30. Lieut-Col Manmohan Singh, Deputy Director, Sainik Welfare, said ex-servicemen, their widows, wards of ex-servicemen and serving defence personnel from the three services with a minimum qualification of Plus Two with at least 50 per cent marks or three-year engineering diploma holders were eligible to take the course. Applications had to be submitted by August 21, a screening test for the candidates would be held on August 23 and interview the next day, he added. Lieut-Gen Noble Thamburaj, General Officer Commanding, 11 Corps, paid his maiden visit to the Army Public School, Jalandhar Cantonment, on Friday. He was welcomed by Brigadier A.K. Pandey, chairman, and Mr Harish Rawal, principal. An Oral Rehydration Solution (ORS) and breast feeding day was held at Military Hospital in Jalandhar Cantonment on Saturday. Mr Hemant Contractor, chief general manager, State Bank of India, inaugurated the new regional business office at Civil Lines on Tuesday. He said the focus of the office would be to gain insights through customer contacts, marketing campaigns and measurement of customer satisfaction levels. A rakhi-making competition was organised at Seth Hukum Chand SD Public Senior Secondary School, Kapurthala Road. The students made rakhis using toys, threads, glitters and accessories. Ms Manju Arora, principal, appreciated the efforts of the students and gave away prizes to the winners of contest in different classes. A rakhi-making contest was also held at Delhi Public School. Children of Classes I to V came up with wonderful ideas and made decorative rakhis during the contest. Sanya Puri, Manik Sharma, Salit Dua, Gurmannat Singh, Garvit Bibra, Siddhant Attri, Prateek Jain, Arundhati Sudan, Charanjot Singh, Aashna Narang, Drishti Marwaha and Ravya Maggo won prizes in the contest. Taking a break from studies, students of the Delhi Public School organised a rain dance party on the campus. An artificial rain forest was created with hidden showers and the children had fun running through it. Even the teachers participated. They played games like Dodge Ball and Simon Says with their teachers and danced to foot-tapping numbers.